Once a month, when time permits, Kurt Leong, a North Shore fireman, dives into the water at Black Pot in Hanalei Bay to help physically challenged Kaua‘i residents do something he can’t live without: Get in the water. Born and raised in Kailua, O‘ahu, Leong has always been in or around the water. 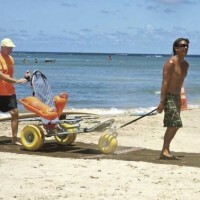 Like most island residents, he grew up surfing, and it is a lifestyle he maintains to this day. A combination of this passion for surfing and the start of a new phase in his life four years ago sparked Leong’s interest in giving back. In 2007, after working as a flight attendant for 20 years, Leong, 52, retired from Aloha Airlines. And while he is still a fireman on Kaua‘i, working as a captain at the Hanalei Fire Station, Leong found himself with more time on his hands than he knew what to do with. 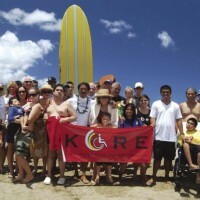 Kaua’i Ocean Recreation Experience ambassador Lisa Insalata says it stirs her soul to see Kaua’i residents and visitors with disabilities riding waves. Providing an opportunity they might not otherwise have, she is part of a group of volunteers who help individuals with disabilities such as traumatic brain injury or multiple sclerosis catch waves at Hanalei Black Pot Beach each month. “The ocean provides such therapeutic and medicinal benefits, and for me to share that with others is one of the biggest gifts of all,” Insalata says. Kaua‘i Ocean Recreation Experience celebrated one year Saturday on Hanalei Beach. Read more from this great article from the Garden Island . Lots of photos. Our first anniversary – August 2010!